The inspiration for much of David Barnes art work are the mountains of Snowdonia and the coastline of north Wales and Anglesey. As well as painting the dark brooding colours of the north Wales landscape. His paintings are influenced by Welsh artists Sir Kyffin Williams, Gwilym Prichard and Wynne Jenkins. 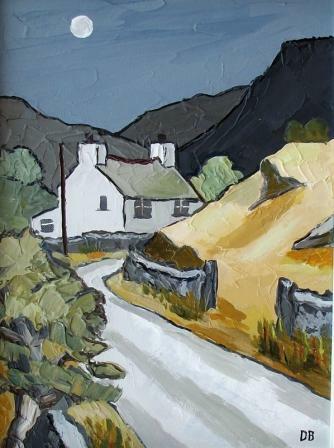 This can be seen in ''Cottage in Moonlight'' where the simple style complements the subject matter and joins a long tradition of Welsh vernacular painting.